First things first, this meetings’ setting is a very casual one. We want to create a society for exchange of knowledge and ideas of people doing/interested in Bioinformatics/Applied Statistics. The idea is to bring them together and we hope that this will be beneficial for all of us. Tool Of the Month (TOM) is a platform to discuss the various tools and methods that we use in our research. We can discuss various bioinformatics algorithms, softwares, packages in R/Python/Perl/any-of-your-favourite-language. And if you want to talk about your research that’s even better! Each time we meet, we will have one or two talks about a method/tool/idea in a format the that can be freely decided by the presenter. And if you want to continue the exciting conversation with the eclectic crowd, feel free to take it to nearby restaurants/pubs. What’s more, you can receive credits, by only presenting once and actively participating to TOM meetings! Next generation sequencing (NGS) represents a comprehensive and increasingly cost-effective approach to diagnose genetically challenging disorders. However, diagnostic efforts with these methods have so far primarily focused on single nucleotide variants (SNVs) and short insertions and deletions (indels), leaving 40% to 70% of patients undiagnosed depending on the level of prescreening. Generally, the development of bioinformatics tools for copy number variant (CNV) analysis from NGS data lags behind that for other variant types. Additionally, the annotation of CNVs remains quite laborious since the few existing CNV databases are not as comprehensive or well curated as databases for other types of variants. In this talk, I am going to present the current advances and problems in developing CNV analysis for different NGS data types with some concrete examples. The reproducibility of research findings has been recently questioned in many fields of science. This problem is partially caused by testing multiple hypotheses simultaneously, which increases the number of false positive findings if the corresponding p-values are not properly corrected. 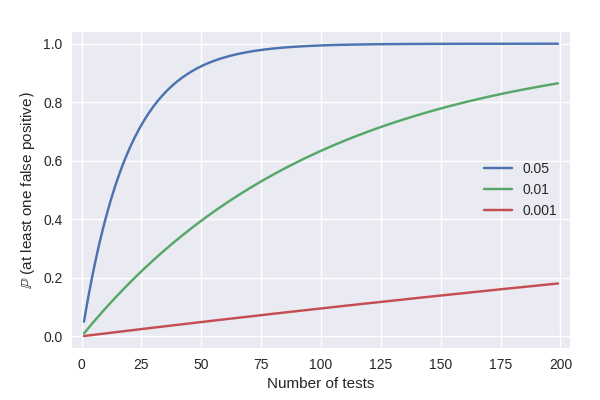 While this multiple testing problem is well known and has been extensively studied for decades, the classic and advanced methods are yet to be implemented into an accessible and comprehensive Python package. Here we developed a software called multipy (MULTIple hypothesis in PYthon), which is an open-source, unit-tested, and freely available collection of procedures for controlling the family-wise error rate and the false discovery rate. We hope that this effort will help to improve current data analysis practices, as well as facilitate building software for large-scale group analyses. At present RNA-sequencing is a very popular method to measure gene expressions. The data generated from sequencing machines are required to go through QC, filtering and quantification steps or pipeline ( collection of softwares). There are plenty of tutorials in the internet or workshops available to learn any of these pipelines. However, many times they are difficult to implement/install in users own desktop or server (like Taito supercluster of CSC). Here, I present a pipeline 4-RNA-seq which can be easily installed in any Slurm based job scheduling system such as Taito. Further, I will discuss how to execute and customize it. Target audience : Those who want to make their own pipeline in superclusters. New single cell technologies offer high-dimensional quantitative data. Technologies like mass cytometry and scRNA-seq are used increasingly in clinical research, especially in the study of cancer and immunology. This creates an unprecedented opportunity as well as a computational challenge due to the vast amount of data produced in each experiment. I will give a tutorial style talk on the existing methods to overcome this challenge and will present Cyto, a computational framework designed to rapidly integrate these methods and adapt to new research questions. Cyto is fully open source and currently only available in developer version. I hope the talk will be beneficial both for bioinformaticians and biologists interested in single cell transcriptomics and proteomics. Although there will be some small code examples, the talk will highlight the main steps in single cell analyses using a mass cytometry dataset from ovarian tumors as the central example. Astrocytes are involved in brain pathologies such as trauma or stroke, neurodegenerative disorders like Alzheimer’s and Parkinson’s, and many others. Determining the timing of morphological and biochemical changes is important for understanding the discrete steps of cells function in health and diseases. Most widely used approaches for image-processing and quantification analysis are either manual cell counting or semi-automatic techniques. Currently, we lack a fully-automated and efficient image analysis tool to quantify astrocytes. In this study, we developed a fast and fully automated a graphical software that assesses the number of astrocytes based on Deep Convolutional Neural Networks (DCNN) technique. Based on the fast-learnable image features of this type of cells, DCNN may grant the most efficient solution. The proposed method shows strong positive correlation with the manual counts. introduce the visualization of the results. The first step of downstream data analysis usually involves data exploration through different types of visualizations such as barplots, boxplots, histograms, scatterplots and heatmaps. This can be a quite tedious step, often requiring to adjust parameters or to analyze different subsets of data. Moreover, browsability of the data by project collaborators can be difficult due to data sharing policies. In this talk I will show how to use Shiny and Plotly, two R packages, to produce interactive custom-made visualizations that can be used to explore your data and that can be shared as online apps with your collaborators. Feel free to bring your computer with you if you want to try to build your own app. A necessary functionality performed by every chemical biologist is to analysis the similarity or diversity of the drug molecules, prior to their screening experiments. Owing to the wide variety of methods, chemical biologist currently require the aid of a chemoinformatician to perform such analysis. Toward that end, we introduce C-SPADE, an open-source exploratory web-tool for interactive analysis and visualization of drug profiling assays (biochemical, cell-based or cell-free) using compound-centric similarity clustering. C-SPADE, in real-time, allows the users to visually map the chemical diversity of a screening panel, explore investigational compounds in terms of their similarity to the screening panel, perform polypharmacological analyses and guide drug-target interaction predictions. C-SPADE provides an intuitive representation of the chemical space by capturing and visualizing underlying patterns of compound similarities linked to their polypharmacological effects, thereby reducing the time required for manual analysis in drug development or repurposing applications. The web-tool provides a customizable visual workspace that can either be downloaded as figure or Newick tree file or shared as a hyperlink with other users. C-SPADE is freely available at http://cspade.fimm.fi/. In this I talk I will briefly take you through C-SPADE and its functionality, providing a demo of its usability with a case study. Multiple sequence alignments and phylogenetic trees form the basis of comparative sequence analyses. Downstream analysis pipelines, however, can easily grow overly complex with each added tool and branching dataset. To address the issue I’m building Wasabi: a web-browser based, graphical environment for evolutionary sequence analysis. Wasabi is designed for joint visualization and analysis of trees and multiple sequence alignments, and incorporates external tools and databases to a coherent analysis platform. My talk will introduce Wasabi as an analysis tool in a public server (http://wasabiapp.org), visualization provider for web services, and interactive plugin in scientific publishing.